Work for 8x8 Virtual Office? Learning about 8x8 Virtual Office? "Average Platform for Office Phone Usage"
I like the convenience of knowing at a glance who is on a call (via the Virtual Office desktop). My favorite feature is probably receiving my voicemails through my email software. I get my email to my mobile phone, so I like being able to listen to the messages and respond to my clients as the calls come in, rather than having to call in to a voicemail system remotely to get my messages. The software seems to glitch often. When I have the virtual office desktop open, it causes my desk phone not to ring, which means I often miss calls. Additionally, unless everyone in the office has their software running, it's difficult to utilize the software to it's full potential. Our service reps are constantly on the phone, so our receptionist loves being able to know if she is going to have to send someone to the vm pool, or if a client can be sent to a live person. Additionally, when messages are left on the general vm it is easy for our receptionist to forward those messages via email to the correct personnel. "The best VoIP system that actually works for every business!" 8x8 can do just about everything you need a phone system to do. 8x8 continues to enhanced their system to meet the increasing demands of customers. Tech support could be improved to have 24/7 Tier one phone support in the U.S. The Philippines tech support staff don't always understand the problem right away to solve it quickly. If you don't have technical experience find an technical person to assist you in setting up the phone system, especially someone who has experience setting it up. Like most VoIP system, they expect you to do it yourself with remote support. 8x8 is a great system if it is setup correctly by someone who knows the system. Customer was paying $1500 a month with AT&T and now he is paying $135 a month with 8x8 and getting more features. The ability to answer business calls from anywhere in the world has been helpful. We don't need a receptionist to answer our phones anymore, saving us money. The auto attendant routes calls for quickly to the right department, to give the customer a better experience. Voicemails are routed to the correct department. Sales people don't have to sit at their desk to receive a sales call by using the 8x8 app, they can receive calls anywhere, never missing a sales opportunity. During power outages, we never miss a call, as the system continues to route calls to our cell phones. Our old phone system ran out of extensions as our company was growing. We will never run out of extensions with 8x8, as we add new extensions as needed. What VoIP solution do you use? There is absolutely nothing I like about this service. -Support is terrible. Our average ticket resolution time is 64 days. -Virtual Office Desktop application is so full of bugs it’s completely unusable. -Any issues presented to support are responded to with “its a known issue, we’re working on it, we don’t know when it will be fixed.” You can’t call app breaking bugs a “known issue”. -If to ever make the mistake of enrolling in their beta program, it will take you months to get unenrolled. -Support will argue with you and insult you. They also like to make things up to explain their frequent network problems. None, in fact this is causing us problems. The phones go offline multiple times a day, which is apparently a “known issue”. "Flexible, powerful and it works and helps me work." The calls to the office can be transparently mirrored to a cell phone so i can be reached by a client at any time anywhere. The fax and voicemail to email feature is invaluable. Sometimes outgoing calls seem to hang and never connect or get completed, without any status update or reason requiring a hang up and redial. Occurs on both cell and office phone systems. Highly recommend if you need office and mobile phone support, fax and voicemail to email capability and very effective e-fax technology. Conducting business on the go, faxing from anywhere, and receiving calls and faxes on the go and storing faxes and voicemails with client files. It certainly increases efficiency and professionalism to have your office phone available in and out of the office and seamless faxing is excellent. "Sub Par Service and Features"
That’s it’s VOIP integrated. Convenient. Cons- you took away my ability to fax documents via cell phone on the 8X8 app. This was the biggest most valuable feature we had and is vital in our company management and daily operations from remote locations. I’d like it back or find someone who can provide that service. All calls, e-mails, and faxes are received at the same location despite where you may be. Convenience of answering the phone no matter the location. received Email/fax all go to the same place. I’ve been a customer since 2012. When I first came on board, we could send faxes remotely. This was a huge advantage and was 90% the reason why I joined 8X8. Our technicians could take care of business and fax paperwork anywhere at anytime. We never had a single issue with sending fax. Shortly after, you took that feature away. I have expressed my discontent and have been told repeatedly fax capability will return with your next update. Well, that been over a year. It still makes me sick to know the #1 capability was taken away and you increase monthly prices since then. 8x8 has given me to cross platform my communications. I have a desk phone, Windows laptop, android phone and an IPad. No matter what device I am using I can share the data and answer calls. Allowing for notifications for voicemail, faxes and SMS on all devices for priority information does not slip through the cracks. Set up and making changes to the profile and services is not a straight forward as it could be. You can only send SMS from the main number not other extensions. Web conference does not allow remote computer to take over a presentation and control the screen. Make sure you have a a good stable internet connection. Understand that the cell phone of other data is not always a good connection. "A Good Service Though Pricey for a Small Business is High"
I like the Virtual Office soft-phone and the integration with browsers and MS Office, especially Outlook. Cost is high. I have a fairly powerful PC but I am getting frequent warnings that I have too many apps open and it is affecting Virtual Offices performance. It is difficult to have a professionally voiced greeting installed and changed for voice mail. The user interface for setting up and using the auto-attendant and time of day functions is unintelligible and essentially unusable. I have worked in telephony on Avaya , Mitel, and other systems; 8x8 is, by far, the worst I have ever used. Make sure you know what you want and read carefully the guides (especially for the auto attedant as 8x8's software is not intuitive to use. The simultaneous ringing of my office and cell phone allows me to have near constant availability. A lot of functionality and on the fly modifications to the phone system. System outages seem can occur as frequently as 2 times a year, which can be a large nuisance for my organization. If you have a small organization that is connected to a very stable internet lines it will work great. There can be outages (more than we would like to see), but all in all a fairly good product with a lot of functionality. Softphone program tends to go down roughly once a quarter. This makes it so that our team can not make calls directly through the softphone. Additionally, the system requires very stable and fiber lines in order to create the best call quality. I can make calls from my work number from anywhere I am and I don't need a "work" cell phone to do it. The app is free and pretty user friendly. Sometimes there are glitches in the app after I hang up a call. I also don't like that you have to subscribe and pay extra for the SMS service. This software is convenient, reliable, and has great quality. It is perfect for mobile offices. I like that both my work contacts and personal contacts can be accessed from the app. and that I can join meetings right from the app on my phone. It supports companies that have multiple offices and mobile offices perfectly. "Good product but would like more features"
Easily find co-workers to chat and call. I can load the app on my phone. When I misplace my cell and I'm by myself at home I can use it to call my cell so I can find it. The web meetings don't work nearly as well as GoToMeeting so only used that feature once and I don't think we have this feature anymore. There's no notification that remains on my desktop when someone contacts me over chat. If I don't see it when it comes in I miss it. Even though it is supposed to launch automatically on startup it doesn't show me active until I launch it myself (no login required though). We no longer need phones at our desks and all the contacts in my organization are there. I can call and receive calls from 8x8. "Easy way to work virtually "
8x8 makes it easy to step away from the office and still be able to take care of business. I like being able to answer and make calls from my cell phone when mobile. We have an after hours answering service and it is easy to log into account manager to modify the times calls are switched over. Sometimes when using my cell phone the call quality is not the best. When the internet goes down at the office we cannot recieve calls. 8x8 allows our staff to work remotely and still know what is going on in the office. You are able to check your missed calls at the office from your cell phone. "Wouldn't recommend it, there has to be something better." Its easy to move to a new phone, different desk, or work from home with a person cell. Call IDs are not available after call ends. Goes down frequently. Accounts are pricey, and there is no easy way to delete inactive accounts in bulk. Even deleting them individually too quickly can cause issues for the entire 8x8 system. Although we aren't sure if its directly related, we experience an unusual number of call issues, audio issues, etc. Not all statuses are available from a single drop down, you have to switch to an 'active' status to change to a different 'offline' status. Agents sometimes get stuck in calls or receive calls while offline. The service is overall finicky. Its not uncommon for 8x8 to just not be responsive, resulting in adherence being tracked incorrectly (which is especially painful when agents are expected to comply with a strict adherence standard for their metrics). However, switching to something else is a long and cumbersome process. Deleting inactive agent accounts is a nearly impossible process, so that will be costly in the long run with managing partners. I would recommend considering other options. We use 8x8 for all of our phone contacts with customers, outbound and inbound and tracking schedule adherence. It is also used as a general timeclock for non-phone agents and specialists. It definitely accomplishes these tasks, but could do better. We don't feel that its the most reliable or efficient. "8x8 is great... when it works"
The software does exactly what it needs to, but sometimes they have technical issues that get in the way of day to day business. When you are working with VOIP software, you can't have an outage every day and expect to maintain business. The call quality is very clear and we haven't had any issues with them working with our desk phones either. The technical issues mentioned above. Their technical support is also very difficult to get ahold of, and often they are unable to decipher the problem in a quick and timely manner. They are pricey as you scale up. There are other companies out there that can do the same thing for cheaper. 8x8 does help us to keep track of everyone that is calling us, and make sure that we get back to them in a timely manner. Being able to communicate with your customers remotely is a huge benefit. I like that I can quickly and affordably contact my colleagues from any of our offices around the world. I also like that I can take my office phone with my on the go through 8x8's mobile app. We had quite a challenge getting the system set up. It took several tries to get 8x8 to stop routing our calls through an international server. Also, the video conferencing tool is all but useless. The system can't handle multiple videos at one time. The phone also crashes from time to time like any other software program. If setting up the system in multiple countries, make sure they're routing your calls out of the correct regions. We're solving the problem of connecting colleagues all around the world without paying crazy international calling fees. We're able to efficiently and affordably connect all of our employees. Very easy to use and both the cell phone application and desktop application are simple, easy to use and straight forward. Being able to send faxes via the web/pc with no restrictions is a great service. Pricing is a bit high and cell phone application connection can be unstable once in a while. Great for internet faxing and receiving faxes via email. The phone set up is easy and very straight forward. There really are not any bugs that I have encountered. My use is primarily to deal with my clients and vendors. It has a call directory service so all call can be directed to the right individuals. Voicemails and Faxes are sent via email updates also which is helpful in keeping in contact with clients and other business contacts. "Excellent Enterprise Communication Platform "
There are several great benefits to adopting the 8x8 platform. I love having the ability to access the virtual office tools, from a browser, my desktop, and even my personal cellular device. I love being able to forward my office phone number to my mobile device when I am traveling for work. I typically run into a bit of a delay with the forwarding features of the virtual office. The support sites for the platform are not easy to navigate and it is easy to drown in the information that is available. We use 8x8 as our main communication ecosystem with desk phones, and virtual teleconferencing. "Easy to use, simple userface"
I like that it provides an easy to use interface to access missed calls. It is helpful having a company directory to see people's availability. The presence notification makes it easy to access availability. The only thing that I dislike sometimes is when the notification screen stays on the computer screen. Sometimse the information on my missed calls remains on the Polycom call device and does not coincide what is on my computer screen. It is somehow confusing to remove the notification. Try to explore other functionalities and encourage use with other business partners. It is useful in organizing the calls and to see previous communications. I use the call functionality mostly but would like to use it more for meeting arrangements. It would be helpful to link with Outlook because I arrange my meetings on Outlook and don't want it to redundantly be on this as well. Timely and efficient assistance! Ordering new lines is a very simple process. And on the singular occasion we had an 8x8-related technical issue, their support was able to walk me through the exact steps to fix it. I'm not a luddite, but I'm not IT either - it was simple and easy. Nothing of note. It is not the cheapest service available, but they keep their pricing relatively fair and are willing to work with clients to maintain competitive pricing. 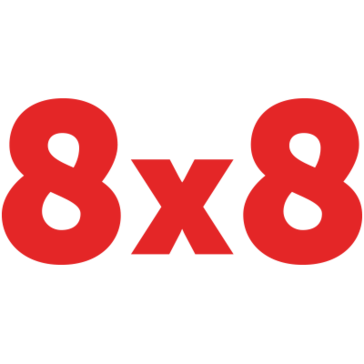 8x8 is our primary phone vendor -- tremendously easier than working with traditional phone providers. Issues with billing, new services, et cetera are always handled rapidly and efficiently. I called today to discuss inconsistencies in my rates - Katie and the enterprise sales teams were fantastic and solved all my concerns in under 30 minutes. "Customer Service is a Joke." I liked the Virtual Office. It helped with the keeping the phones lines covered. I have been a customer since 2000. We have had 4 different accounts numbers with them. But quality changed last year. One representative will say one thing then the next will say it never was documented and refuse to assist saying that the call has become "unproductive". @Jeremy Carroll is the supervisor who agreed with each point I made about how they did not follow their own procedures but would not help with the billing error. Bad Bad Bad. There is lots of other providers available. Stay away. It was a small amount but every penny counts when you are a small company. Move on. They will find that what ever is the problem you can spend more money to fix it. After our internet provider upgraded equipment their software would not work any more. They suggested that we buy new cable modems and routers to fix problem. Then when we tried to move to another provider they held the number hostage for another billing period. Never deal with companies who do not care about the customer. Move on. "Great service, but lacking in Linux support"
Call clarity is great, and the newer mobile apps make calling and meeting creation / joining super easy. The lack of a Linux client. Our software shop is ~70% Linux, so the lack of a native client is a bit frustrating. The new beta web-based UI for meetings works well enough but it's limited, feature wise; as time goes on that may solve a lot of our headache, but a native port of the desktop app would still be nice to have. Worth it, especially if replacing on-premise systems. Keeping mobile sales and marketing folks connected wherever they may roam is the biggest, but we've also started using the web conferencing more and more. "8X8 is a phone system keeps your business open for calls 24x7"
We only use the 8x8 Virtual Office on our work stations and/or cell phone or Ipad. We can work in the office on wifi, but if it is down the calls go to our cell. If I am out of the office and need to call a client I can open the 8x8 app on my mobile phone and the caller id shows my business number and the call can be recorded. In the insurance business it is necessary for our calls to be secure. 8x8 is HIPAA compliant. We have not found any real problems since we implemented the system. If there is a weather situation that we can not get to the office we can take all our calls from home on our computer or on our mobile phone. "Beware of the bait and switch"
Customer service is terrible! I have been switched to 5 sales reps in less then years. Everytime you need to add a line, you had to speak to your rep. I sometimes waited two weeks for service requests to be added. Now the latest scam is they have increased their pricing even though I was supposed to be locked in for 3 years. They said they have the right to change it. Hmmm what is the point of signing a 3 year agreement then? Very disappointed. When setting up my system initially, I had to figure everything out on my own. I called customer service and often they did not know how to help with what I needed. I ended up telling them how to fix it. Completely unacceptable! Stay away! I used to recommend this company to all of my business associates. In the last year or so, the service has gone completely down hill and they have increased their pricing to more than double on some features. I have a 3 year agreement with them and they basically told me , we can do that. Well, I can change companies. Beware of the bait and switch and know that an agreement means nothing to them. "After 2 years with 8x8 I'm still happy!" I like that I can use the app on my iphone to answer phone calls and it appears as if I'm sitting in my office. It can ring both in my office and on my mobile, or I can set up to ring at office first and then my mobile. Lots of flexibility. I had problems with the app when I had an Android phone. It was not as functional and consistent as my iphone is now. Plus I don't like that I can't tell if an incoming call is personal or business, unless I recognize the caller of course! There are so many options to be flexible with 8x8 depending on your business needs. However this means that setup and changes may require getting an 8x8 rep on the phone to help. Be patient. They are worth it. Having a fax! Two area codes so I have local numbers for two regions. All numbers can be flexible to ring at my desk and my mobile. Having a professional phone system with an automated attendant has been a game changer for our company. I also like the power keys option so that my office manager can field calls when I am unavailable. It is also a great having multiple lines available. The ease of transfering an existing phone number to the system. It is very hard to have to start new when you've been using the same phone number for years. There is not much to dislike, we have been on the system for about 3 years and have not had any problems. As a small office can connect with our clients using the mobile app when we are not physically in the office or working from remote locations. The Auto Attendant has also given our company a more professional presense with the voice system options. We have enjoyed the physical phones as well as the softphones on the computers. The mobile app has been a great as well. "Gets the job done, but have had difficulty getting employees to actually make use of it." I like that it integrates the virtual fax, visual voicemail, contact directory, with presence. The SSO is very useful with Google. The phone app is not very reliable. Calls don't alway ring through. Wouldn't recommend for phone app features, only desktop use. The user interface is clunky and not intuitive for many people I administrate so they don't end using the app and revert to just their cell phone and desk phone instead. Make sure it meets all of your needs before switching, not recommended solely for a mobile only environment. It solves issues with being limited to a traditional desk phone or local PBX. The remote access features for the extension are useful, and it allows the company phone system to easily span multiple locations. Support is nearly nonexistent and once you do get someone on the line they are usually not the right person so you get thrown back into the queue waiting to get someone. How good is your sales ops team? they will need to be able to config and trouble shoot most issues on their own. Tracking metrics for dials in SFDC. Our office is totally virtual, our entire team works from their home. with 8x8, we are all able to access the phone and voicemails as if we were in a physical office. It is user friendly and customer service is very helpful. I love the text messaging feature, but when I log out, the conversation history is deleted, and if someone texts the number while I'm logged out, the message is never received. Great for off-site employees and phone access while out of the office. The great benefit to us is being able to use a softphone on the computer, so the phone can be answered at the desk, or mobile phone, or laptop if on the go. I've never had an issue with call quality or anything like that. Some people who really take the time to learn how it works enjoy using it. It's not intuitive to use at all. It pops up randomly on my desktop without being prompted, and I constantly need to check to make sure I'm still logged in. I try to work around it as much as possible and use my desk phone because I don't trust it to ring consistently for inbound calls. Inbound and outbound dialing. Voicemail recordings. I think it can text too, but we don't us that. "Great VOIP system, Love it!" The easy of use and customer support when needed. Also, love the Virtual Office and Mobile app. I do not have any dislikes. If I could change one thing, I would like to be able to text from one of my virtual numbers but understand why I can't. I deal with many business owners with time sensitive data. Having 8x8 VO running is paramount to my business. The seamless move to my mobile phone when I leave the office makes this happen. "A great alternative to a standard phone system"
8x8 Virtual Office gives you everything that a standard phone system provides, with the additional benefit of mobility. It's a great alternative to being tied to prior phone technology and not being able to work as effectively away from your desk. You never have to miss those important calls! You do want to make sure that you have a great internet connection, so it helps to be with a provider you can trust. This can be a great way to "cut the cord" with your old phone provider and to take your business into the 21st century. 8x8 Virtual Office allows you to check work voicemail or answer business calls from anywhere. "Good VOIP package but not quite great." I like that you can use a desk phone, laptop, or mobile to call your colleagues regardless of where you are. It is also very easy to hand off a phone call in progress from one device to another and not get disconnected. The text chat works well and includes emojis. The reliability hasn't been there 100% of the time. There have been multiple instances when colleagues had issues connecting to conference calls. There have been a few instances where the service went down due to the main server that runs 8x8 was down. Text chat doesn't have the ability to send photos/files yet (at least for me). 8x8 makes it easy to hold virtual meetings and conference calls. Integrated messaging makes it easy to contact colleagues as long as they are connected to the service regardless of where they are or what device they are using. 8x8 is providing a phone system that integrates 3 separate sites into one common internal phone system to easily dial a colleague in another state or another country. "Work from anywhere with 8x8"
Easy to switch from mobile app to desk phone (I use a Polycom VVX 401), and even to desktop app while travelling. Work from everywhere and stay in touch with clients as well as workplace proximity associates. A HUGE benefit would be allowing SMS/text messages to an existing 800 number (already owned on the account), or a way to setup a short code that can route to an email address. We use Zendesk - I will need to setup a brand new number (and list both on our website) just to receive texts. Communication across multiple locations - our manufacturing staff have trouble communicating with themselves, much less with our business office. 8x8 helps them connect, and lessens the excuses. "Good Small Business Phone Service"
I tried unsuccessfully to use their service for a Fax line and it was disappointing. I had to go back to the old landline provider for that line. "Good for small businesses, but not great." 8x8 offers an app so employees can seamlessly transition from working at their desks to working remotely. Their app and system are easy to use. 8x8's customer support is lackluster. They often seem to barely understand their own programs, and provide scripted responses rather than working with the customer to evaluate the situation. We have encountered a few bugs with their systems, and getting those addressed by CS is a headache every time. We are transitioning some employees to 50% remote work, so 8x8 has been useful in making that goal a reality. Their price point is good for our small business, and a fair value. If we were a larger business, though, we would likely switch. "Good system at a good price"
I really like that I can have my fax and phone, and as many phones as I want to add to one system. Sometimes the system goes down or my desktop disconnects from the system which means I have to reboot and sometimes call customer service to trouble shoot. Make all of the features a little easier to use. If you use rarely use the features, then it is hard to figure out how it works. I work from home and am often on another line or out of my office. I love that I can have the call forward to my cell, so I can answer from anywhere. Also I can talk over my computer if I want to answer from my desktop app. Management, I am able to forward phones, edit connections, routing, messages, presence, just everything from my desktop app or phone. Nothing to dislike at all, everything works as it should and I am always excited to see new improvements. This is the future, 8x8 is better than the competition, ease of use, peace of mind and superb support. You can't go wrong. We are able to present a cohesive front to the world despite being spread out regionally, our clients reach a tech in 2 rings or less! "8x8 is an outstanding product"
The customer service was very helpful when getting set up initially and has continued to be helpful when needed. I have not had to use the customer service often, but they have remained helpful when needed. The user interface, while not impossible to move around, has a bit of an outdated appearance and can be clunky at times. After several months in the system, it is not a problem. This product is easy to use, comes with good customer support and is affordable. As a small business, it is important to keep our costs down. 8x8 has allowed us to utilize a full fledge phone system but at an affordable cost. The user interface is easy to navigate through and figure out. In the process of signing up, the salesperson never told me I was signing up for a one year contract. I just wish the salesperson would go through and make sure I know what I'm signing up for. I was left with a bad taste that this company is more about sales, sales, sales...the whole concept of profit over people. The app would log me off so often so I just left it off until my one year was up. I just didn't see much added value that surpasses all the free services out there. Never communicated exactly what all I'm signing up for up front. "Horrible Service and Customer Service"
I like that you can perform phone calls on the service most of the time. I took ownership of a business back in 2016 and was easily able to add my business bank onto the account but was never notified that the banking info did not match with ANY names listed on the account and was never able to transfer ownership. Its 2 years later and the service stopped working at my business, so I call to get assistance and I cannot crack the "passphrase" or any of the names that could be on the account to get ANY sort of help. I immediately switched to Spectrum because I needed a working phone in my business immediately! Spectrum is up and running really well, so I call 8 x 8 to cancel and I again, cannot crack a code to cancel.. So I fill out their transfer of ownership form (which they send me a sample of and I had to re-create the form on my own word doc (lol so professional)) and sent it in and still SOMEHOW the account will not transfer over to my name. I called numerous times, spoke to Skyy and she told me a supervisor would call me in 24-48 hours and no one called me. At this point Im not surprised, but I call again and they're solution is for me is to cancel the charge with my bank account. This is honestly the worst company in the history of phone companies I've ever worked with. Billing department and accessing the account I am paying for needs to be re-organized. None, unfortunately it created many many many problems and headaches. 8x8 has exceptional customer support. I’m not technical savvy in relation to computers and they were extremely patient with my questions and lack of technical speak. The pricing is very competitive as well. At this moment, I don’t have any dislikes to report. My service has been running smoothly. As a small business owner I utilize this service to enhance communication with my employees and the customers we serve. We paid for the system in savings over about 6 months and have had absolutely no problems with it once we got it set up. Nothing. All of the issues are basically on our side ... not knowing all of the system's capabilities. Very stable technology and excellent customer support, even for non-techy people. Saved a ton of time and money with online meetings and 800 number access. "Click to dial time saver "
"Best Virtual Phone service I have ever used"
The fact that that it just works. The option to seamlessly switch between my real phone my virtual phone on computer and my cell phone. Phone call quality is excellent even on low bandwidth internet. Canadian local numbers let me travel and work from a small island and clients never know I'm not in Canada. Could be better price for one line but quality is more important as I run a business. You will be very happy that you went for this option. Get the phone box as well so you can connect into a real phone. Computers crash so you want to use a real phone and headset if you make calls all day. One number for clients and no matter where I work calls come directly to me. I like how easy it is to message people within my company. we’ve had plenty of issues with this product. My personal desktop application won’t make outbound phone calls. Other users phone just won’t ring even when they’re in the calling group. We’ve had a lot of problems with no real complete solutions. Quick response times within the office. A lot quicker than emailing. "Crashed during important calls frequently"
The integration with Outlook was helpful. With just a click I was able to add a meeting link to a calendar invite from a reply email to a prospect. Making phone calls internally was easy. The txt feature to prospects was cool too. Ut crashed all the time while in the middle of a video conference. The phone calls dropped and had trouble connecting frequently too. The Salesforce integration was new, but didnt work most of the time. Customer service was almost non responsive. It's a shame. The UI was nice and it was pretty easy to use but it was so buggy that it's impossible for me to recommend. If the customer service was better I'd say it might be worth it to see if things have changed. Video conferencing, dialer, internal messaging. Virtual office allows us to conduct business even when we can't get to our office due to severe weather. Figuring out the settings could be made easier. Watch the youtube videos that are available for support. They help. Many people like to receive text messages instead of voicemail. If I need to be away from the office, my staff can still transfer calls to me as though I was right in the office. Its given me 24/7 access and the ability for me to be at my desk all the time! TCB....Taking Care of Business! "8x8 could use a remake"
I like that they have a really good call forwarding option. We do a lot of calling as a part of our company and it integrates really well with our platform that we use to track clients. I don't like that this is a separate system from our platform and our internal communication system. It is just more difficult and less productive when you're dealing with multiple different programs. Their display is really old school, they could probably work on the design and visual element to make the program more attractive. make sure you are able to integrate this well or it will just be another program you're adding to the list of programs you are already working with. I also think they should vet multiple other options and make sure this is the right fit for them. While it is a relatively simple application, it can be tedious at times and doesn't run as smooth as posible. It is helping us call our clients and track our calls, one feature that I really enjoy is that we are able to save our calls and listen to them back again in case you missed a section or someone wasn't available for the phone call. "No looking back after poor local phone service." Vast amount of options. If power is out, I can still answer the phone on my cell phone. This has only happened once or twice in 3-5 years. Chat support could be faster and easier to access. Technology upgrade improvements could be communicated better through email notifications. Multi line phone system. Savings of tremendous amounts of waste. "8x8 makes it easy to manage and grow our business"
The 8x8 system is easy to setup, easy to manage and provides a range of options to manage, monitor and grow business without the hassle of a traditional phone system. I wish the reporting was a little better but exporting data does accomplish the reporting that we need. 8x8 has removed the hassle of messing with servers, phones, activations, etc. When i bring on new employees, they send me a new phone and its up and running in minutes. * We monitor all 8x8 Virtual Office reviews to prevent fraudulent reviews and keep review quality high. We do not post reviews by company employees or direct competitors. Validated reviews require the user to submit a screenshot of the product containing their user ID, in order to verify a user is an actual user of the product. Hi there! Are you looking to implement a solution like 8x8 Virtual Office?